Sometimes, you might want to start your web-browser in safe mode because of an unstable browser for browsing on internet. This happens most of times with internet users and the main cause of it is i think installing themes, extensions, add-ons, and due to customizing codes etc on your browser. So when you're going to start using your browser, these things are also to be opened. thus as a result, your browser takes time to load while opening. But in case you don't want your browser to take time while opening then you have to open it in safe mode. 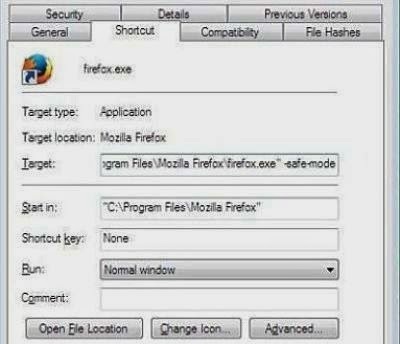 Well, here suppose that you're using mozilla firefox browser as your default browser for browsing internet and want to open your firefox browser in safe mode then you arrived just in the right place because here we'll be sharing two easy methods using which you'll be able to start your mozilla browser in safe mode. What Is Firefox Safe Mode? In an easy to understand language, firefox safe mode means that starting the browser in such a way that all custom settings are disabled. i.e No add-ons, themes has to be loaded while opening firefox browser in safe mode. After explaining safe mode in firefox, I'd like to explain how actually you can open your mozilla in safe mode. So please have a look at the below two methods in which using any method, you will be able of starting firefox in safe mode. This method is for those who don't want most of the times the firefox to open in safe mode but at the times when they want. In this method, we'll be making use of run command in order to get access to our goal. So first open Run and paste the below line and paste it into the text box there. Now click on ok button so you will see firefox opened in the safe mode. Look at the below screenshot for better understanding. 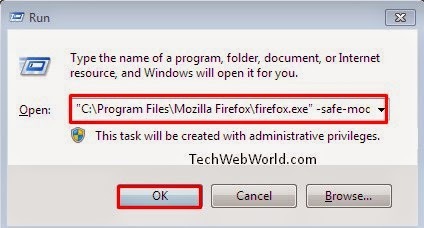 In this method we are going to share a trick by which you will be able to open firefox in safe mode at any time you start your mozilla web-browser. In this method, you will have to make some changes in the firefox's shortcut on desktop. So if you don't have a shortcut on desktop then create a shortcut and paste it to desktop. Now right click on that and select 'properties' at last, add the below line at the "Target" text box under the shortcut tab. After pasting the above command, click on OK so you're done everything you were required. Now just open the firefox.exe by double-clicking on it. You will be getting a message like the below screenshot while opening the firefox in safe mode where you have to click on "Start in safe mode" button to get starting. In case you don't want firefox in safe mode anymore, then just remove the -safe-mode from the above command you placed under the target text box. And that's it dear readers. I hope you liked our today's tutorial. Keep visiting our blog for getting more useful tutorials. your comments on this post are highly appreciated. Feel free to ask if you're facing any problem while implementing one of the above method for opening firefox in safe mode.